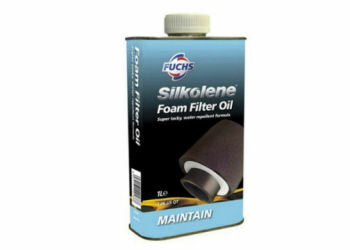 Advanced, low viscosity coating treatment designed to improve the efficiency of foam air filters. Contains polymeric additives to provide a hyper-tacky surface that resists the ingress of the most pervasive sand, dust and water, without affecting engine breathing. Developed to provide outstanding engine protection even in the most severe conditions. Reduces the risk of breakdown and helps extend engine life. The chlorinated solvent-free formula will not damage the foam filter construction or air box materials. AJS Tip: Keep a spare oiled filter in a plastic bag with your spares kit. Change air filters between dusty races.